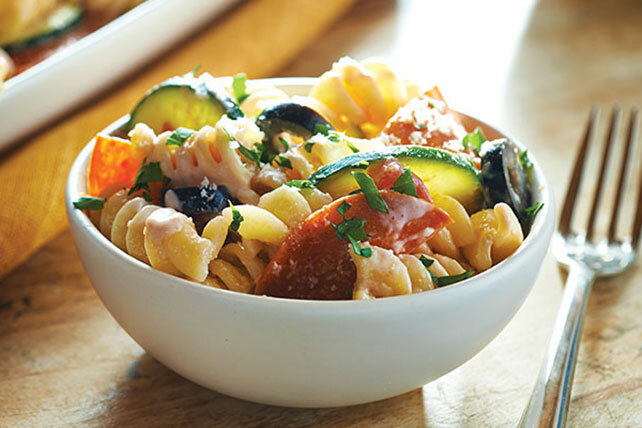 Make marvelous Mediterranean Pasta Salad with rotini pasta and yummy veggies! Dress Mediterranean Pasta Salad with mayo and Parmesan for even more flavor. Mix tomatoes and mayo in large bowl. Add pasta; toss to coat. Reserve 1/4 cup cheese. Add remaining ingredients to pasta mixture; mix lightly. Refrigerate at least 1 hour before serving. Sprinkle with reserved cheese just before serving. At 12 servings, this recipe is good to make for a party or family gathering. If there isn't a lot of room in your refrigerator, store the prepared salad in a large resealable bag until ready to serve. Transfer to bowl just before serving. For added color and flavor, sprinkle salad with chopped fresh parsley just before serving.